It's late. I can't sleep. 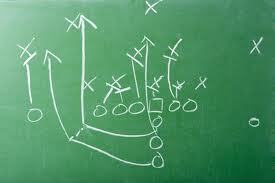 And, of course I'm designing football plays in my head. I think I've got three that would work... every time... unless of course the Ref's treat us like Max Hall and call "intent to deceive". I've never seen any of these before in a college game (though that doesn't mean they haven't been tried). Why is there only one punt returner? The defense is charging down the field, heads down, eyes locked on the returner. With only one guy back, who has to be locked on the ball, its like telegraphing to the entire defense, "I'll be over here... why don't all of you run at me full speed (even though I can't take my eyes off the ball to look at you) and blow me up as soon as I touch the ball." But, suppose you had two guys back to receive the ball (you could easily spare someone up front)... both of them looking up and acting like they are about to catch the ball on opposite sides of the field... Where does the defense run? They can't see the ball overhead. Which guy do they pursue? The uncertainty would slow them down. And if not, then you would at least only have half as many guys to make miss. Reward: Fewer defenders in vicinity of catch and they arrive less quickly. Perhaps an extra 5-10 yards per return. Who is ever really fooled by a true wildcat formation (e.g. running back lining up directly behind the center and taking the snap in place of the QB)? Most often, the running back or safety or whoever is there can't really throw, and its obviously going to be a run, with very little possibility of a pass. The advantage is that the speedier ball carrier gets the ball more quickly and closer to the line, which can be sometimes effective. The disadvantage is that everyone knows who is getting the ball, who has the ball, where he is, and (for the most part) what he's going to do with it (run). The defense positions and pursues accordingly with little hesitation. Why not leave the QB (or another wildcat back) in and have them both line up behind the center, each offset a bit to one side, both with hands out to receive a snap. If both then act as if they get the ball and take off running, and with an enormous offensive line, the defense can't really tell who has it quickly enough to respond before you get the first down. You introduce three brief elements of uncertainty: 1) prior to the play, the defense must consider if it is going to be a run or a pass and prepare/position accordingly (if one back is the QB, the realistic possibility of a pass is significantly increased), and 2) who is going to get the snap (could be either side), and 3) who actually has the ball for the first 1-2 seconds and therefore who should be pursued. Risk: An extra back instead of a blocker or reciever. Reward: Defense must be more prepared for a pass and can't crowd the line. The space, hesitation and uncertainty should buy an extra 1-2 yards, which can be critical in short yardage or third down situations. Putting the ball quickly into the hands of your fastest back is usually a positive, and is the reason for the wildcat formation to begin with. But why broadcast those plans to the other team? Risk: Almost none. Perhaps, increased chance for a bad snap, since it would need to be at some angle. Reward: Split second head start for the running back, and hesitation by defense that would typically be pursuing/watching the QB (and assuming they have the ball). This one might only work in a hurry up offense where the plays are being run at breakneck speed (new Robert Anae offense, perhaps?). You run to the line, and the team lines up with one of the guards (either side) over the ball, but the QB still lines up behind the center. It would have to be a quick snap count, or it could happen during the snap count, but the guard would snap it to the running back. Risk: This one could easily lead to a false start, so it would have to be practiced and perhaps use up valuable reps/practice time. Reward: It would cause some confusion on the defensive line, and with a quick snap, perhaps that could be taken advantage of. However, the upside is not as clear as the first three above. I would love to see BYU run some of these this year. Or, perhaps some of you in the high school ranks could run them and let us know how they go.